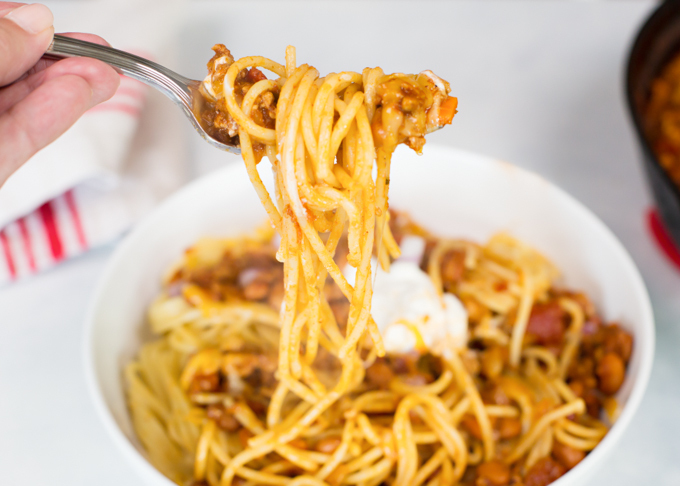 This Turkey Chili Spaghetti is two comfort foods served up in one bowl! 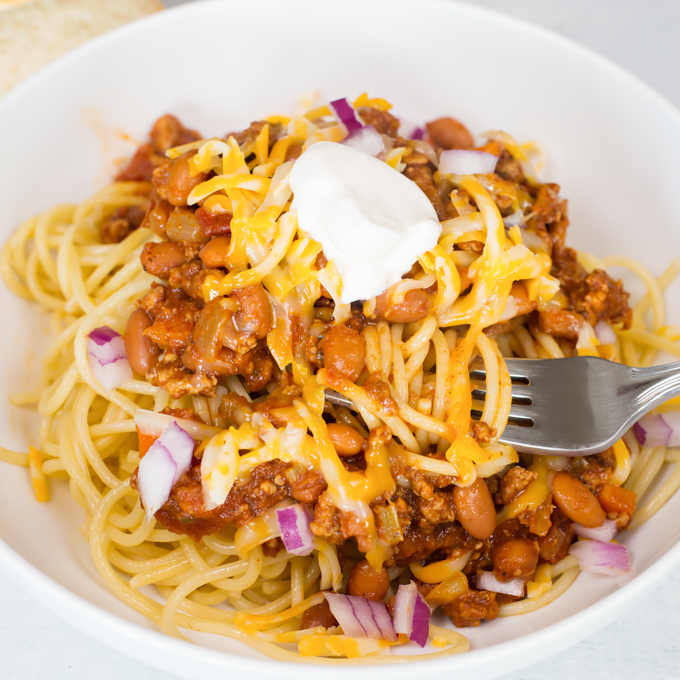 Spicy turkey chili served over your favorite pasta (I used thick spaghetti noodles), topped with grated cheese, diced red onion, and a dollop of sour cream. 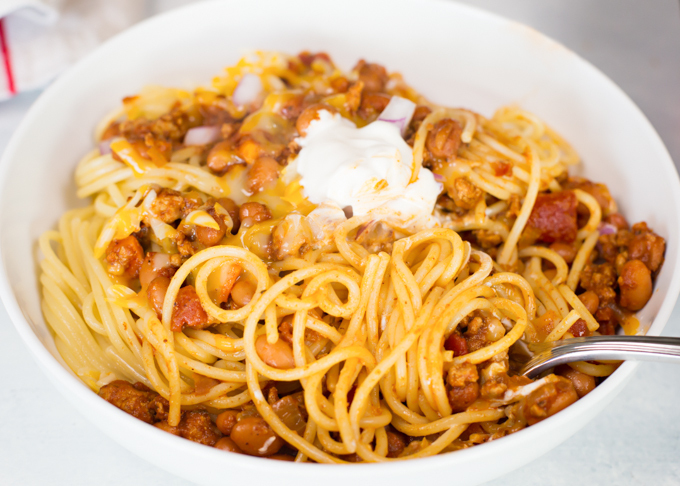 With the addition of the toppings, this Turkey Chili Spaghetti becomes comfort food at it’s finest! I have found over the years that my inspiration for new recipes comes from many areas. Often, I’ll flip through a magazine and something delicious will catch my eye, which was the case with this recipe re-make. 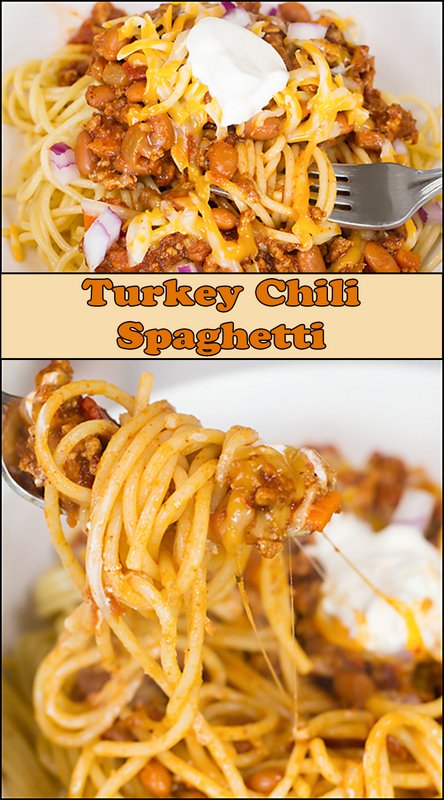 My Turkey Chili Spaghetti recipe was inspired from a recipe I recently saw in the Food Network Magazine. Thank you Food Network for inspiring me to top my spaghetti with my favorite turkey chili. 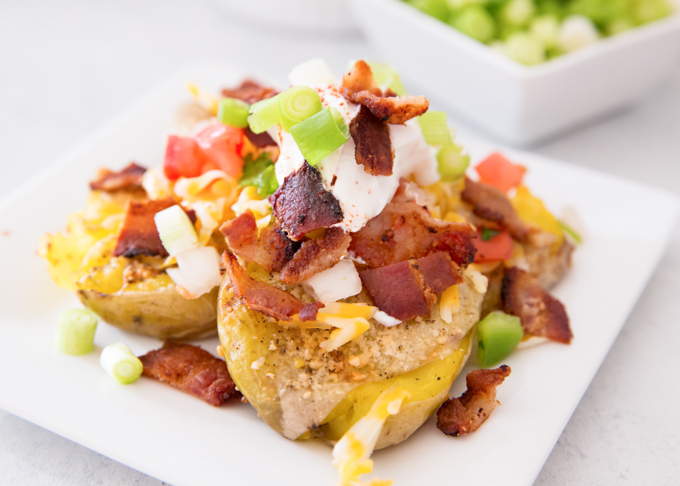 This recipe is so simple to make and your entire family will thank you for it! I also love cookbooks and have quite the collection going. Recently, as in the past few years, when we travel, a new cookbook is my souvenir of choice. I love remembering my vacations whenever I’m flipping through a cookbook. My latest addition was a cookbook titled Eataly, that I purchased from a restaurant in NYC. Now if I can only decide which recipe to try first! The great thing about a recipe like this is that you can easily adapt it to fit your dietary needs. 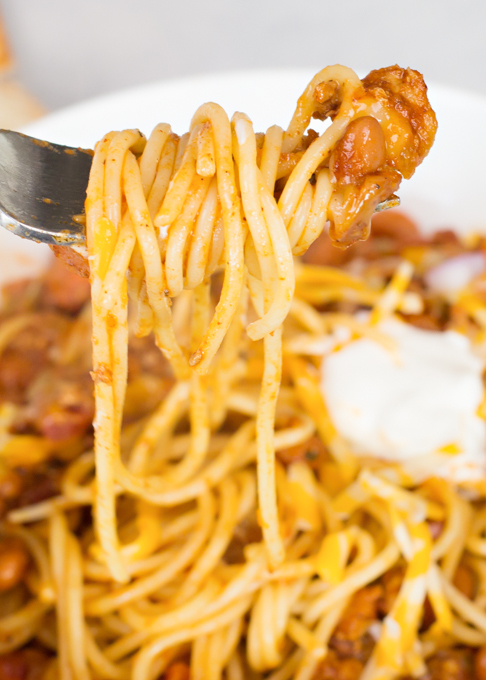 You can swap out the spaghetti for a gluten free pasta or omit the cheese and sour cream to make it dairy free. You could even delete the ground turkey from the recipe and add more veggies and beans for a vegetarian version (please note that there is also some chicken broth added but you can swap that for vegetable broth). Now that you know you can make this to please everyone, I hope you’ll give it a try soon!! Personally, we enjoyed it exactly as shown! Seriously you guys, are you drooling yet? If not, then maybe you should try adding a little more cheese! Heat 2 TBSP olive oil in large skillet over med high heat. Cook ground turkey, stirring occasionally to break up. Remove from pan with slotted spoon and drain if necessary. Add additional 1 TBSP olive oil to pan and lower heat to medium. Add chopped onions, celery, and carrots. Cook, stirring often, until vegetable are al-dente tender. Add garlic and cook for another 2-3 minutes. 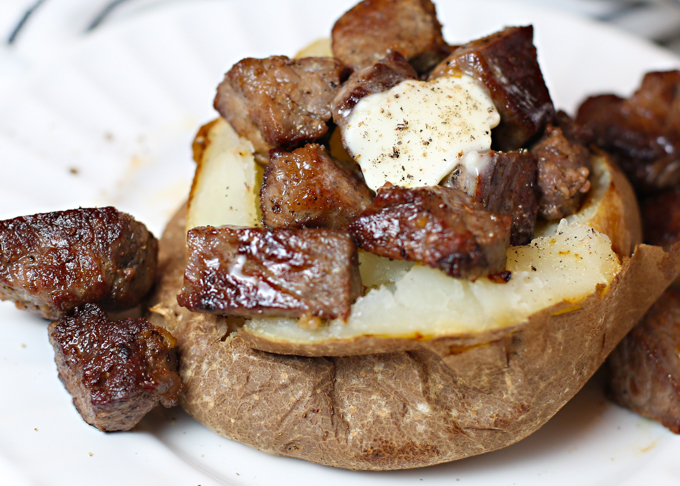 Add meat back to skillet. Stir to combine with veggies. Add in the chicken broth, canned tomatoes, and tomato paste. Stir until combined. Gently stir in drained beans and spices (chili powder, salt, pepper, cumin, red chili flakes, & brown sugar). After turkey chili comes to a low boil, reduce pan and continue to simmer for 20-30 minutes. Chili will thicken slightly and the flavors will blend. At this point, you can turn off the heat and reheat chili right before serving. Right before serving, cook pasta. 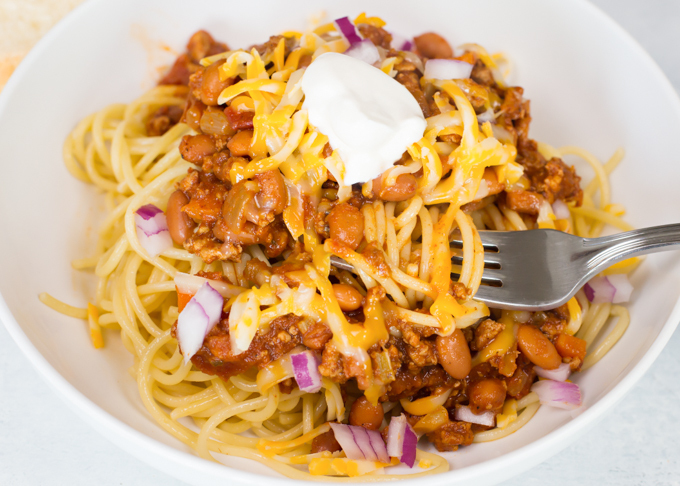 Serve chili on top of pasta and top with grated cheese, chopped red onion, and sour cream. 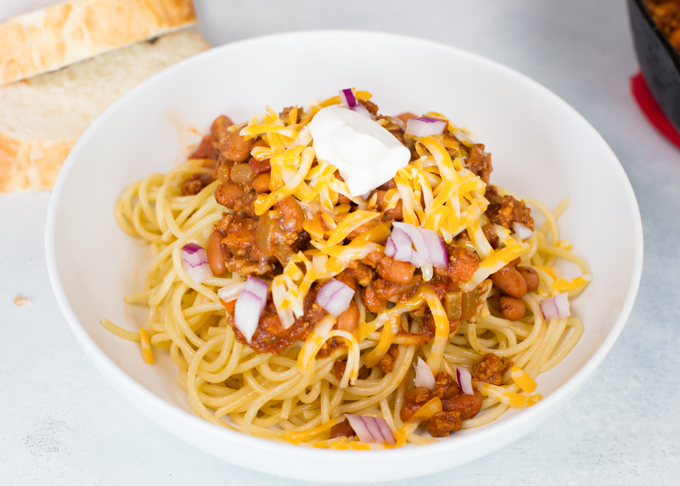 I highly recommend serving this Turkey Chili Spaghetti with a side of Caesar Salad and homemade Garlic Bread. And, don’t forget to head over to Southern Plate and check out their weekly Meal Plans! 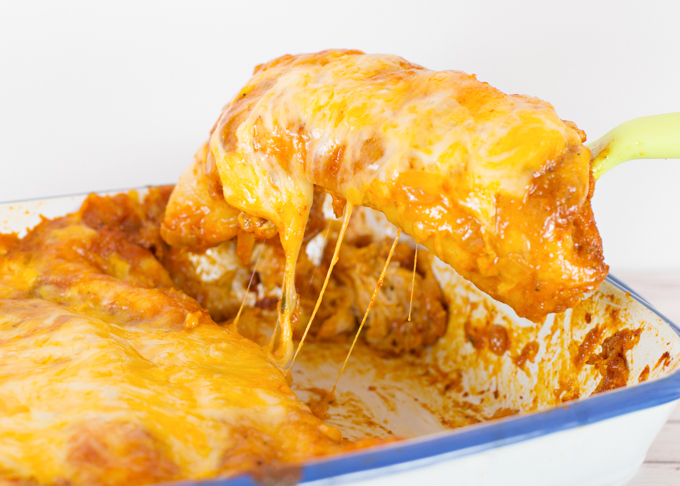 This looks like PURE comfort food – 2 of my favorites in 1! What a fun dish! What a great idea- I never thought of combining the two! 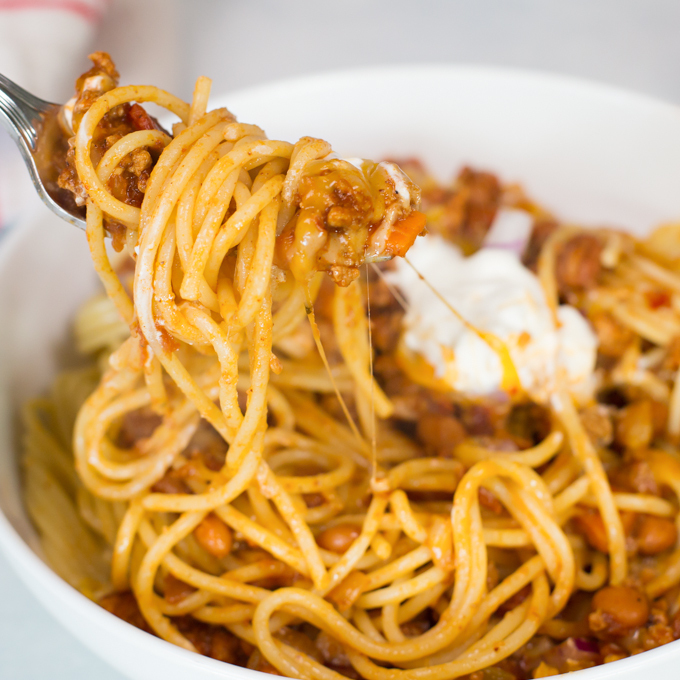 I love chili and pasta together! This looks delicious! Such a flavorful recipe. Great pictures too.